This resort combines an elegant yet informal setting to offer singles, couples and families a high-quality vacation. 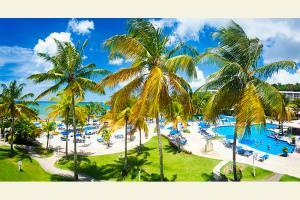 Located on St. Lucia's west coast, the resort's 360 rooms circle the large pool. The all-inclusive resort concept is "For You. About You," which means complimentary use of kayaks, snorkeling gear, windsurfers, and sailboats. Water skiing and banana boat rides are also complimentary. The grounds feature lighted pathways that meander through gardens and recreational areas for a truly relaxing and scenic escape. 1 hour from Hewanorra International Airport. Four restaurants and four bars.